Website branding is both simple and nuanced. There are some basic elements that every website should have in order to support the identity and niche of your blog or online business. 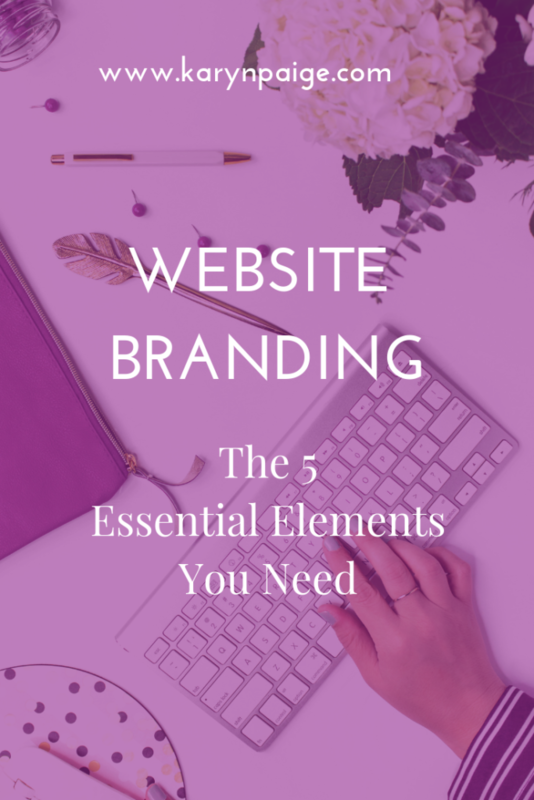 Once you identify those essential elements, it’s up to you how you choose to design them. Creating the branding for your website is a lot like building the wardrobe in your closet. Just like a stylist would tell you that every woman needs a Little Black Dress or the perfect-fitting pair of jeans, a web designer will tell you that every website needs a few key pieces to complete your branding collection. When I’m designing a website branding package like the premade kits in my Etsy shop, I usually start by choosing the color palette. This gives me a better idea of the overall look and feel for the total brand. Most website color palettes include five to seven shades (including a shade of white and black). Of course, there are exceptions to every rule. I’ve seen websites that are completely designed in black and white and they looked super chic. I’ve also seen monochromatic palettes where everything is made up of several shades of pink. Picking the fonts for your website branding package can be really fun once you understand the way fonts express certain moods and feelings. Serif: Recognizable by the little feet on the letters, serif fonts evoke classic and traditional design. They are perfect for titles or headers and large blocks of text. Sans Serif: Meaning “without serif,” Sans Serif fonts are have clean, minimal and modern lines. They are also perfect for titles/headers and large blocks of text. Display: These fonts are very stylized, like something you might find in a sci-fi logo or Broadway marquee. They should be used sparingly as a logo only and not for large blocks of text. Scripts: These fonts look like handwritten lettering or cursive. They can add a very personal touch. Like display fonts, they are meant to be used sparingly. Font Pairing is a major trend in website branding. That means picking two fonts that work well together. For example, you could pick a serif font for your headers and titles, and pair it with a sans-serif for your paragraph texts. Lately font pairings have expanded into trios, and web designers will add a third font (usually a script or display) that can be used sparingly as an accent. A free tool like Google Fonts [insert link] is a perfect place to search through hundreds of fonts. They also include recommendations for pairings. The header logo is the main focal point of your website branding. As you are preparing to build your website [insert link], you’ll want to have your header logo created so you can get a sense of how it will look on your navigation bar. A lot of people over-design their header logos with fanciful font choices or graphic images. If you’ve ever watched Project Runway, you know Tim Gunn is always telling the contestants to edit their designs. The same principle applies to your website’s header logo. It’s perfectly okay to keep it simple and just stick with a text logo that doesn’t have any graphics or icons. If you’re just starting out and you don’t have the budget to get your logo professionally designed, take the pressure off of yourself to design something that’s too intricate. It’s not uncommon to see blogs and online businesses go through a rebrand ever few years or so as they grow. An alternative logo is something you can use when the dimensions of your main logo won’t fit into the space of wherever you’re placing it. 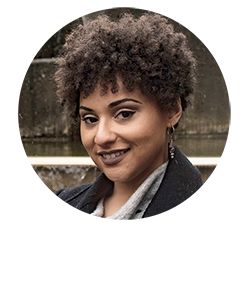 For example, if your logo is a long rectangle that isn’t very tall, it might not be the right size for a Facebook profile image, which is more of a square. Alternative logos aren’t used as often as your main logo, but it’s nice to have a backup in case you need it. Submarks are the final icing on the cake that is your website branding. Submarks are also known as site icons or favicons. Basically, a submark is a small accent element. If you’ve ever looked at a Google Chrome tab, you’ve seen a submark in action. It’s the little icon on the left hand side of a web browser tab. For example, Google’s submark is the letter G inside a white circle. Submarks can also be used as social media profile images or your brand’s icon. I like to think of using submarks the same way you might use a rubber stamp on paper. Don’t overthink your website branding. Some of the best branding out there is as simple as can be, and that’s why it stands the test of time and is still relevant. In the end, it’s all digital. Nothing is done that can’t be redone or undone. You should always feel free to change your brand design if it no longer represents you and your business. Are you getting ready to build your website? 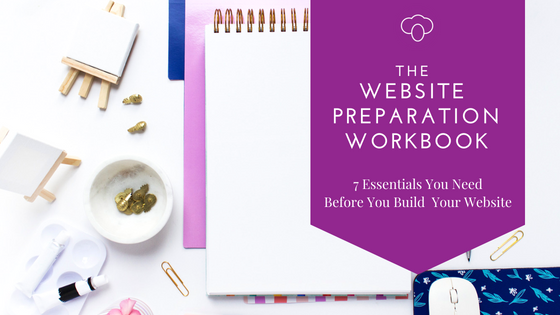 Grab The Website Preparation Workbook and discover the 7 essentials you need before you start to build.